Lower price isn’t the only Rapco Fleet Support/KADEX Aero advantage. We offer long life brake products for King Air 100, and 200, 300, 350 (B300C), Beech 1900, B99, BeechJet 400A (XP), Falcon Jet, Hawker, Learjet, Citation, Sabreliner 60, EMB-120, Metroliner and Jetstream J-31. Increased cycle life over the OEM with substantial cost savings. 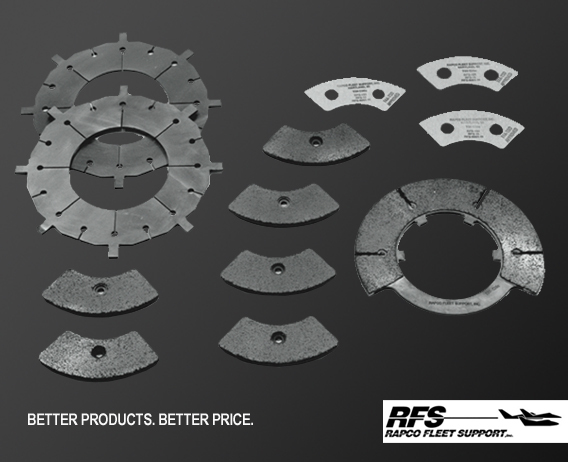 On average RFS brake products are 40% less expensive than the OEM. Because we’re not as big as the OEM, in addition to our savings, we can offer something they can’t: Flexibility and Timing. Our quick turnaround, with most orders shipped same day earns us repeat business and supply agreements. When we don’t have a product on the shelf, we make it. Successful, continued operation of any aircraft fleet relies on adherence to tight margins. Since 1994 KADEX Aero has helped regional and corporate operators generate a profit by dramatically reducing their brake costs.